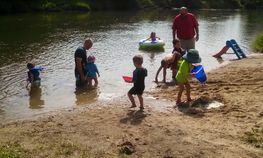 Hutchinson Family Farm Campground, Decorah, IA | Canoes, Kayaks, & More! Our on-site kayak/canoe rental and shuttle services are convenient and hassle free. Just set up camp, rent a canoe or kayak and we shuttle you upstream to drop off points of 2, 4, or 6 hours paddle time. When you reach the campground, just pull your boat onto the landing. When you're done your campsite or vehicle will be waiting for you. 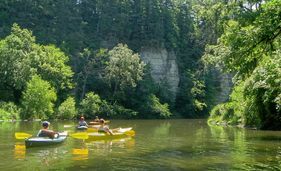 You will have paddled the most scenic part of the Upper Iowa River, and there is no waiting for shuttle pick-up. 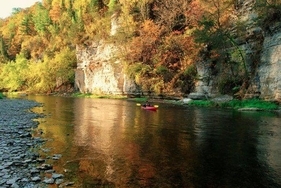 If fishing is your sport, the Upper Iowa is one of the Midwest's finest rivers. Walleye and trout are frequently reeled in, however, smallmouth bass fishing is the best (just ask our grandsons). Wildlife flourishes in our river valley. Pheasant, turkey, and deer make for abundant fall hunting. Hunt for a day or a week, you and your dog are always welcome. We have 2 children's play areas as well as swimming with free use of life jackets. 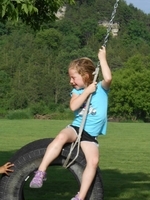 Inner tubes and water toys are also available. We would love to talk about the farm and agriculture in general. 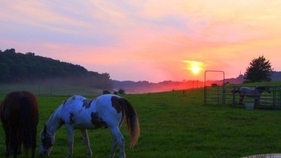 If time permits (both yours and ours) we offer farm tours free of charge.